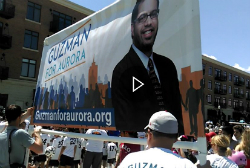 The short VIDEO below shows highlights from the Guzman for Aurora contingent marching in Aurora’s Memorial Day Parade. At the end of this post look for details about joining us for the next parade: the July 4th parade. Go to the Guzman for Aurora website to learn more about Rick’s candidacy, and go HERE to learn more about it on this site and be linked to a highlights VIDEO from Rick’s Kickoff Rally held in late April. It’s very short and shows a leading community activist, an appellate court judge, former fire and police chiefs, and the president of the Real Estate Association making persuasive cases for why Rick Guzman deserves your vote. 1) The parade steps off at 10:00 a.m. on the 4th, so please plan to be there around 9:00 a.m. Right now our group is #70 of about 100 contingents. 2) Park at the new Aurora Public Library, 101 S. River St., in or near the large gravel parking lot. 3) Meet us on River St. just south of the library and just south of Jimmie Johns. The weather’s supposed to be nice, but visors, hats, sunscreen, and water might be good. 4) There will be about 100 Guzman for Aurora t-shirts. That took care of only half of us last time, however, so this time there will also be signs, paddles and other fun things to identify our group—plus if you can wear a white shirt, that will help too. 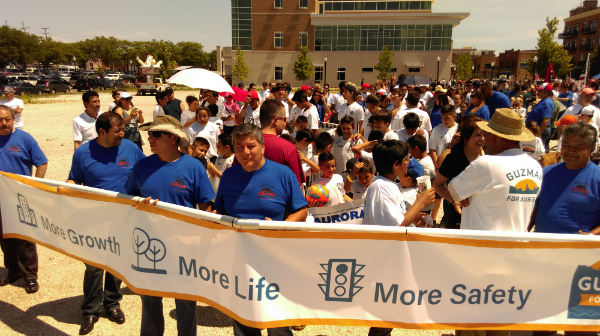 This entry was posted in Social Change and tagged Aurora 2016 Memorial Day Parade, Guzman for Aurora, Rick Guzman. Bookmark the permalink.